First lay your stencil over your favor bag. I find it easiest to secure the stencil to the craft mat with a bit of tape to keep it from moving. 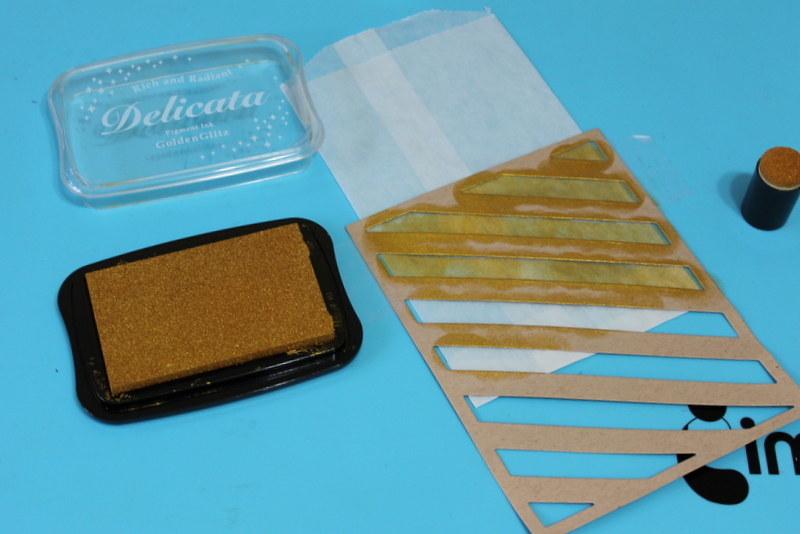 Using a sponge dauber, apply Delicata Golden Glitz to the bag, let dry completely. Once all of the bags are completed, set aside to dry. Since the top of the bag is going to be folded over, I only added the design to the lower half. Cut a series of flowers either with a punch or die from various paper types. Using a script stamp, Delicata Golden Glitz and Brilliance Platinum Planet, randomly stamp the petals. Allow to dry completely before stacking. On a small strip of paper, stamp 'thank you' and cut a 'v' into the end. Stack the flowers starting with the largest first and vary the types of paper. Secure the flowers to each other with a brad or you can add a drop of glue between each layer. Slide the 'thank you' under one of the petals and secure with a drop of glue. Big finish! Add the favor to the bag, fold over the top of the bag and poke a very small hole. Secure the flower to the bag with the brad - this also keeps the bag folded over. You can also close the bag with a piece of washi tape.